Team Alvimedica, the youngest team in the Volvo Ocean Race 2014-15, is also Rhode Island’s home team. Skipper Charlie Enright of Bristol, RI, is looking forward to a hometown welcome when their Volvo Ocean 65 crosses the finish line in Newport, RI next month. Team Alvimedica’s homeport is Newport, so a homecoming celebration is on tap for the nine crewmembers, who have an average age of 32 years. Enright, 30, is the youngest skipper in the race. He graduated Brown University in 2008 and was a four-time member of the Intercollegiate All-American Sailing Team. He met his wife, Meris, at Brown, and the two live in Bristol where they’re expecting their first child. The Newport stopover May 5-17 promises to be action-packed with plenty of public events at the Volvo Ocean Race Village at Fort Adams State Park. Sailing fans also have the unique chance to bid for one of two unique sailing experiences while supporting a Rhode Island heart health charity, Lifespan.org. Team Alvimedica and its owner, medical devices company Alvimedica, are running an ambitious World Heart Health Charity Tour, a global initiative to raise funds and awareness for heart health. Bids can be made on two separate once-in-a lifetime experiences on board with Team Alvimedica at each of the race’s ten stopover ports. All of the funds raised from the team’s auction go directly to the locally designated heart charity. Sailing fans have the chance to bid on bringing their own team of six people to join the Team Alvimedica race crew on one of the Pro-Am Races in the stopover. These in-port races precede the leg start and offer sailors the rare opportunity to actually be involved in crew maneuvers with the professional race team as they compete against the Volvo Ocean Race fleet. Bids can be placed on the team’s website at teamalvimedica.com/auction. The Jump Seat experience involves departing the dock with the race crew and being on board for the initial racing before the fleet leaves the stopover port. The initial part of the leg is sailed inshore with each of the Volvo Ocean Race teams having a Jump Seat guest on board. The Jump Seat riders experience the exhilarating moments of the start before leaping overboard at a safe moment. The “jumpers” are then retrieved by a tender boat and brought safely back to shore. The Rhode Island charity is Lifespan.org, a five-partner, not-for-profit health system. Lifespan.org includes three teaching hospitals: The Warren Alpert Medical School of Brown University: Rhode Island Hospital and its Hasbro Children’s Hospital; The Miriam Hospital; and Bradley Hospital. It also includes Newport Hospital and Gateway Healthcare. All Lifespan-affiliated partners are charitable organizations that depend on support from the community to provide programs and services. For more information, visit lifespan.org. 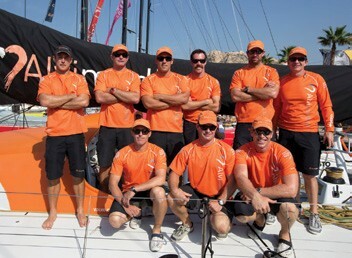 Follow Team Alvimedica at teamalvimedica.com and facebook.com/TeamAlvimedica. Jane Eagleson, Team Alvimedica’s Head of Communication, contributed to this report.